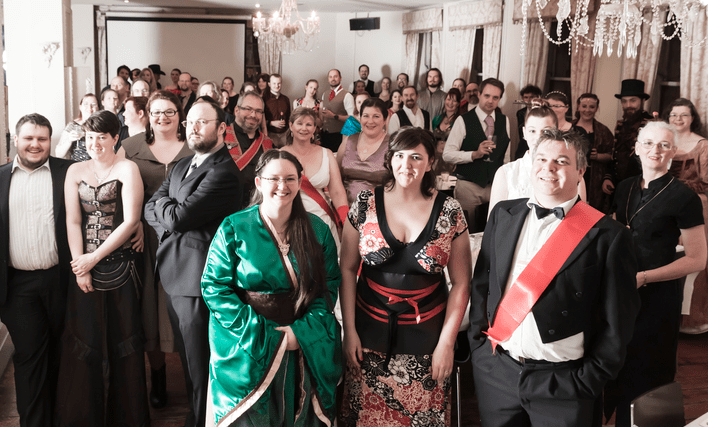 New Melbourne Browncoats, Inc. | Our Mighty Fine Shindig – the Browncoat Charity Gala – is less than a month away! With only 3 weeks until our Browncoat Charity Gala, we’re preparing a mighty fine shindig for you all! There’ll be themed drinks, excellent food and lots of fancy finery to enjoy. Last year’s Sereniversary Ball was a rousing success, so let’s make this one just as good! There’s plenty of tickets left, costing just $60 (packages with shiny swag are also available). And best of all, all profits will be donated to FareShare to help them rescue food and fight hunger. Join us on Saturday, 8 October 2016 from 7-11pm at the Brunswick Town Hall! On arrival at the Brunswick Town Hall, you will be issued with two Beverage Tokens, which can be exchanged at any point during the evening at our Browncoat Bar. Beverage Tokens can be used for basic alcoholic beverages (wine or beer) or soft drinks. Additional drink options will be available for purchase, including a specially curated selection of ‘verse themed cocktails. Our guests are welcome to select their own seating in our grand dining hall, where you will partake in a sumptuous two course meal from our mouth watering buffet. Special dietary requirements can be catered for, so be sure to let us know when you purchase your tickets. We’ll also have some fantastic prizes up for grabs in our raffle and live auction! Fancy winning a limited edition map of Serenity Valley? Or some delicious wine? What about some goodies to add to your Firefly autograph collection? You’ll find more information at bit.ly/NMB2016Gala and you can grab tickets from our online store. Please note that this is an 18+ only event. ID will be checked on arrival, and anyone under 18 will not be permitted entry or refund. Ticket sales close on 1 October, unless sold out. So don’t delay! !